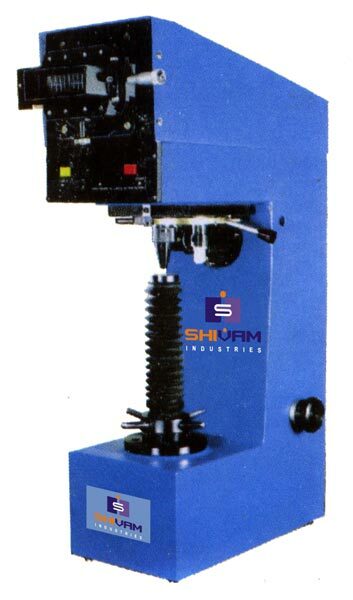 We manufacture and supply Vickers Hardness Testing Machine in India. Our Vickers Hardness Testing Machine is simple & accurate in design. Vickers Hardness Testing Machine is suitable for measuring the hardness of precision metallic parts with wide testing range â�� from soft to hard & accurate results are guaranteed. Our Vickers Hardness Testing Machine strictly conforms to IS: 1754: 2002 & ISO 6507 â�� 2: 1997. There is an indenter in form of a square diamond pyramid forming an angle of 136 degrees between its two opposite faces. The loads used in the Vickers Hardness Test may range from 1 to 100 kgf; these loads may be applied for approx. 10-15 seconds. Once the load is applied, the material is removed and the indentation on the material surface is measured. Vickers Hardness is not to be used for routine testing as the entire process is quite slow. Construction : To accommodate the high precision loading system & an optical projection screen the machine frame is designed sturdy. Specimen is to be placed on testing table. The test cycle is fully automatic. The accurate load is applied on a diamond penetration by means of a lever & weights. The load is removed automatically after a specific lapse of time. The objective is indexed with the test piece & the diamond indentation is projected on the measuring screen. The diagonals of the indentation can be measuring by means of the micrometer screw of the projection screen.